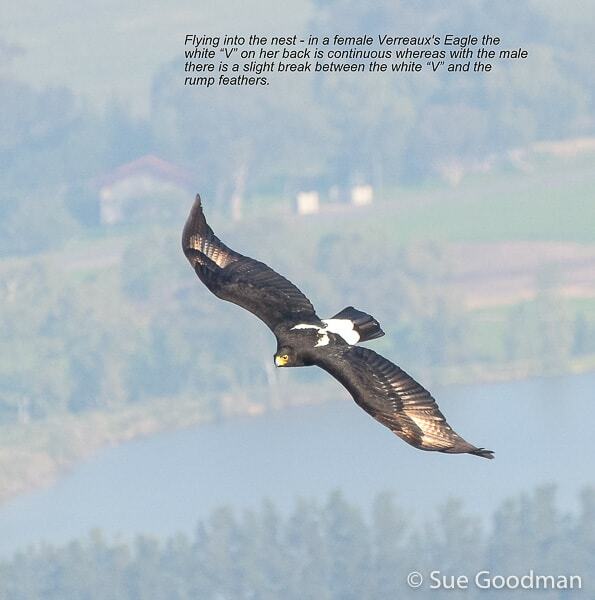 Their proper name is the Verreaux’s eagle and of course they are large African birds of prey. Their preferred habitat is hilly and mountainous terrain and they feed primarily on dassies (rock hyraxes) but also on small mammals, birds and reptiles. 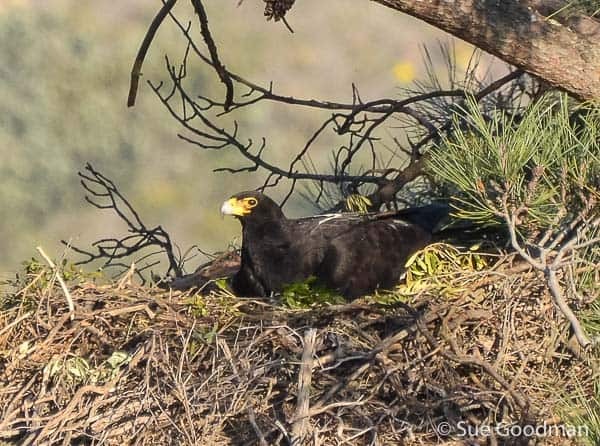 When perched or at rest adult Verreaux’s Eagles are entirely black in appearance, except for a white ‘V’ above the wings on the back and yellow feet/talons and cere (waxy layer covering the base of the upper beak). In flight, the unfolded wings expose a white rump and whitish panels on the outer wings. The wings have a distinctive shape that is broad in the middle and tapering at the tips. Sexes are similar, but females are slightly larger than males. Juveniles have a yellow-brown plumage and the head and back of the neck have a distinctive reddish-brown colour. The face and throat are black. Juveniles achieve adult plumage in 4 years. Verreaux’s Eagles breed with one partner for their entire life, and only replace a partner in the event of death. Often the pairs can be observed perching, preening and flying together in perfect unison. Mating takes place all year round and egg-laying season is between April and July. 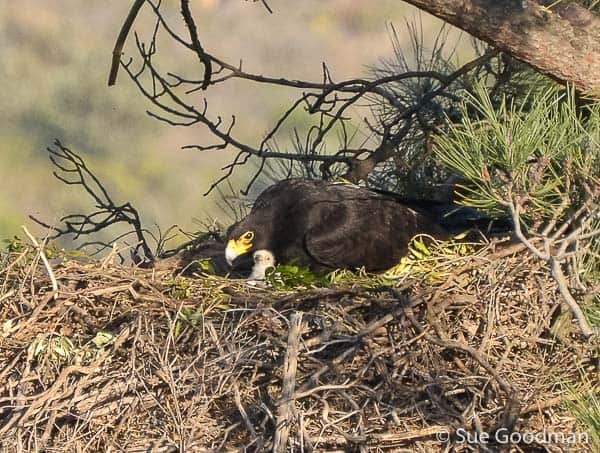 Verreaux’s Eagles produce one to two eggs per clutch. Incubation lasts 38–41 days and is done by the female while the male provides food. In cases where two eggs are laid, the eggs usually hatch about four days apart. The older chick will normally attack and harass the younger chick until it dies. 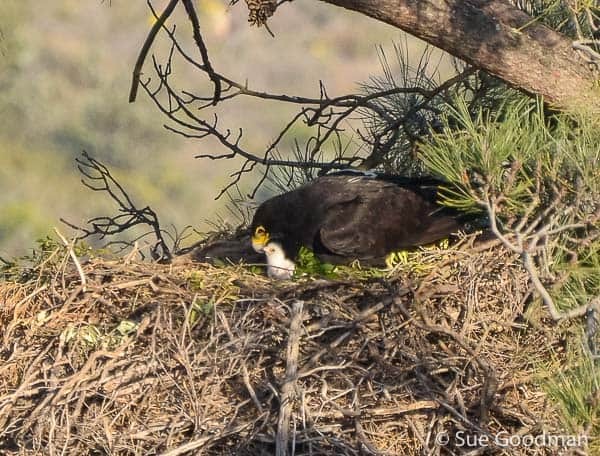 The surviving chick leaves the nest after 12 weeks and is forced out of the territory by the parents.